The Native Plant Nursery at Adkins Arboretum boasts the area's largest selection of ornamental native trees, shrubs, perennials, grasses, ferns, and vines, all ready to take home to your garden. The Arboretum hosts open house events and native plant sales in April and September. Plants are for sale on the Visitor's Center patio throughout the growing season. 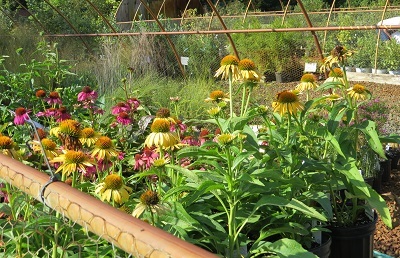 Mark your calendar for the Fall Open House & Native Plant Sale, September 7-9. Click here for current availability. Some of the plants grown at the Nursery are collected and propagated from locally collected seeds and cuttings. No plants are collected from the wild. Learn more about the Arboretum's native plant propagation initiative. Adkins Arboretum does not use neonicotinoid pesticides on any plant material propagated at our Nursery. Further, the Arboretum only purchases plants from reputable growers who have provided certification that their nursery product is free of that chemical. From Route 13, take U.S. 404 W. Turn right onto MD 480 and take an immediate left onto Eveland Road. The Arboretum’s main entrance is 2 miles ahead on the left. Use the South Entrance, before the main entrance, to access the Native Plant Nursery.